Manufactured homes have come a long way since their “trailer” days. These affordable, factory-built homes offer more quality and style than ever before. New homeowners can virtually custom design their homes with the seemingly endless list of options available. Over 22 million people across the country have decided to make a manufactured home their way of life, and by the time you finish reading this article, you may make the same decision. You’ll see that enjoying your dream home in a comfortable lifestyle can be a part of your reality. You may have heard some negative things about manufactured homes. We would like to take a moment to dispel some outdated misconceptions, or “myths” associated with manufactured homes. MYTH: Site built homes appreciate, manufactured homes depreciate. Too many people believe that manufactured homes always lose value after purchase, much like a car does. But studies show that it’s the land on which the home stands, not the method that built it, that determines whether its value rises or falls. MYTH: Manufactured homes are poor quality versions of site-built homes. 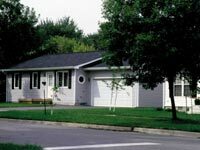 Manufactured homes, unlike site?built homes, are regulated by the U.S. government under a national building and safety code administered by the U.S. Department of Housing and Urban Development. The national code means design, construction, durability, strength, fire resistance, energy efficiency, and more, are all federal matters. The homes are built well—Uncle Sam makes sure! MYTH: All manufactured homes look the same. No way! With all of the options available to the consumer, manufactured homes allow for great diversity in home design. You can choose the size of your home, decide on the layout of your floor plan and pick from a huge list of options. Looking for a 3-bedroom, 2-bath home with a Jacuzzi tub and skylights? What about a cathedral ceiling or bay windows? The choices are yours—from the pitch of the roof to the optional site-built garage, your home is custom made for you. MYTH: Manufactured homes are cold in the winter and hot in the summer. The insulation in today’s manufactured home is similar to that in a site-built home—sometimes even better! With R-values of 21 in the roof and 11 in the sidewalls and floor, a manufactured home is cozy the whole year through. MYTH: Manufactured homes’ walls are too thin. You can practically listen to your neighbor’s radio, right? Wrong! Today’s manufactured homes have interior walls three- to four-inches thick, covered with 5/16-inch or 1/2-inch gypsum. You won’t hear any more through those walls than you will in site-built homes, considering they both use the same materials. Exterior walls are often built using 2-inch by 6-inch construction. MYTH: Manufactured homes have safety issues. People tend to assume that manufactured homes are more prone to fires and other problems than are site-built homes. However, insurance companies have found that manufactured homes, in many ways, are safer than their site-built cousins. The University of Michigan, in fact, found that manufactured homes in the Midwest have a lower rate of fires than site-built homes. Both manufactured and site-built homes have the same copper wiring, but as for the rest, the national building codes are actually tougher than the electrical code that governs most site-built homes. Manufactured homes are safe for you and your family. MYTH: Manufactured homes aren’t quality homes. Manufactured home makers are so confident in their materials and workmanship, most homes are covered by warranties of up to five years, with three years on interior features. What other type of home can offer you a commitment like that? MYTH: The manufactured housing industry is only interested in the short term. Industry members are continually working to improve their businesses. Many companies even sponsor homeowner surveys to assess the overall satisfaction with manufactured homes, including workmanship, customer service and quality. How many local contractors have that kind of commitment to their customers? The manufactured home industry has worked diligently to provide consumers with the best possible homes. These homes have become attractive, affordable, quality options available to anyone interested in finding the perfect home for the future. Living in today’s manufactured home—what a beautiful choice.